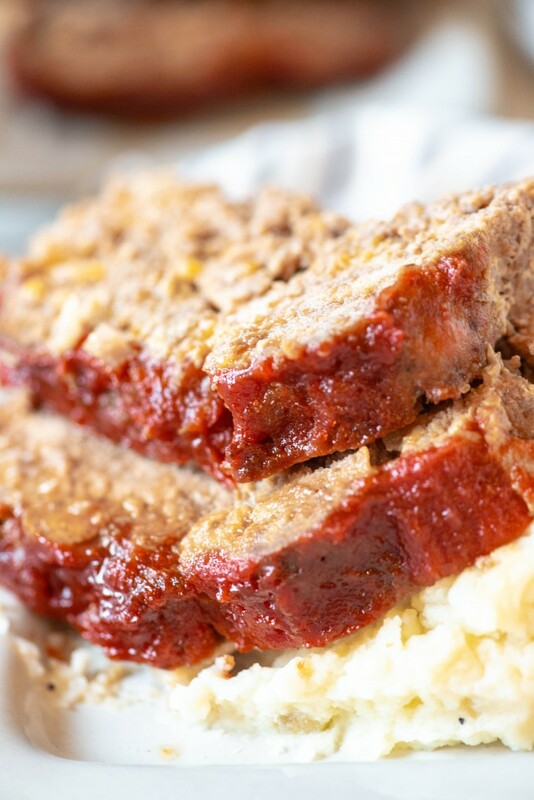 One of your favorite comfort food meals can be ready in under an hour with this easy Instant Pot Meatloaf and Mashed Potatoes recipe! If you’ve ever wondered how to cook meatloaf in an electric pressure cooker, wonder no more! 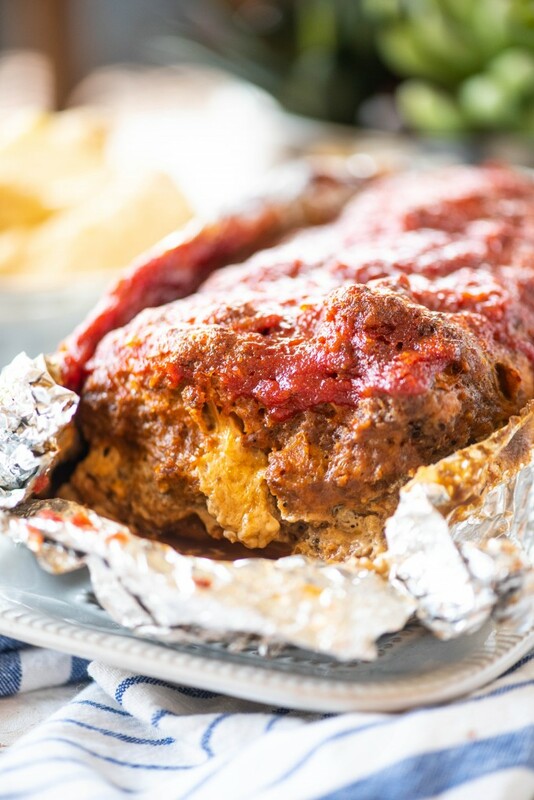 This Instant Pot Meatloaf recipe is so easy and delicious! Meatloaf was one of those meals that I never really liked growing up. It seemed to be on our regular rotation of dinners, and I wouldn’t say I hated it, but it definitely was not in my top 10 favorites. I loved meat in it’s true form (ie chicken breast, steaks, pork chops,) and meat in a “loaf” form just did not sound appealing to me. However, as I’ve gotten older, I’ve truly learned to love it! After years and years of tweaking the recipe to get it just right, I finally have a meatloaf that I love. 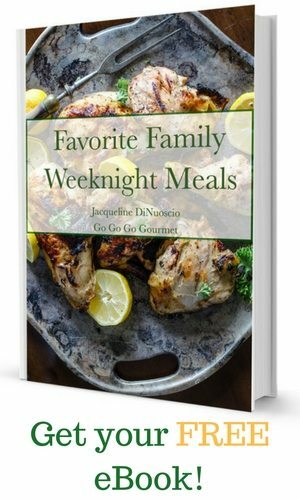 I make it for my family quite often, and it seems to always get rave reviews. 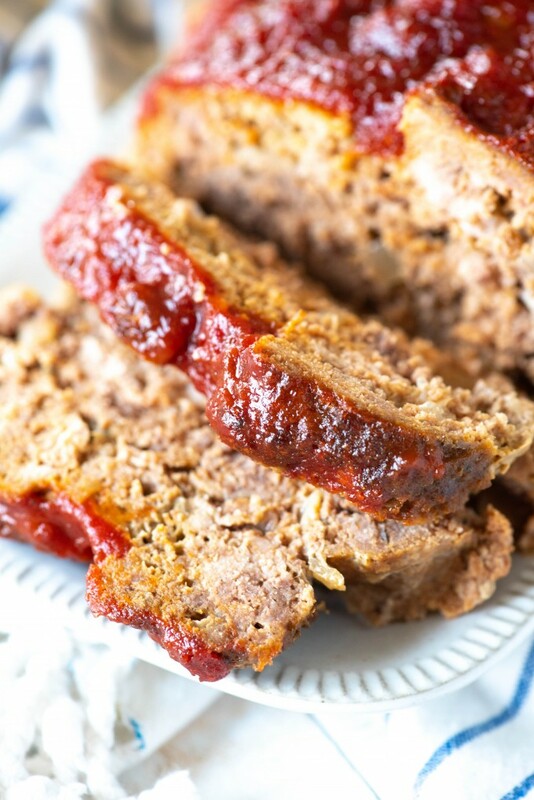 We have meatloaf even more often now that I’ve come up with an Instant Pot version. Comfort food made easy has been my mantra lately, and this recipe is no different. You can have it on the table in under an hour, complete with a side dish! I usually serve my meatloaf with a side of mashed potatoes. The two just go hand in hand in my opinion. But if you’ve ever made mashed potatoes, you know they are a labor of love. You have to peel the potatoes, cut them, boil them, and THEN mash them. That’s a lot of work when you’re trying to get dinner ready in a hurry. 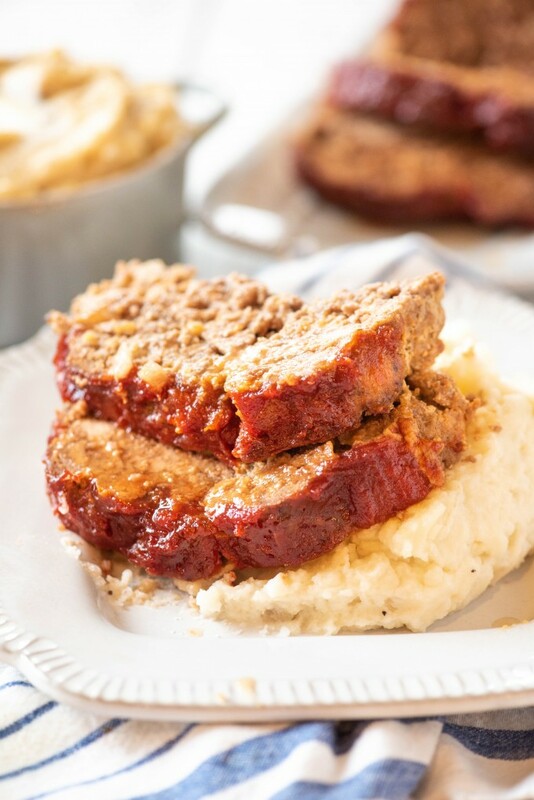 That’s what I love the most about this Instant Pot Meatloaf and Mashed Potato recipe! The meatloaf and mashed potatoes cook AT THE SAME TIME, IN THE SAME POT. How cool is that?? So needless to say, this pressure cooker meatloaf will be added to our regular dinner line up, and I hope it makes your line up too! Plate innere pot into pressure cooker. In a large bowl, combine onion, bread crumbs, ½ cup ketchup, eggs, worcestershire, 1¼ tsp salt, ¾ tsp pepper, beef, veal and pork. Mix with your hands until just combined. Transfer meat mixture to a 2 lb loaf pan and set aside. Peel potatoes; dice into 1 1/2" pieces. Add potatoes to bottom of pressure cooker inner pot and pour in 1 cup of water. Place loaf pan on top of potatoes. Lock lid in place and make sure vent is set to SEAL. Cook at high pressure for 30 minutes. Natural release for 5 minutes, then quick release remaining pressure. Remove loaf pan. In a small bowl, mix remaining 1/4 cup ketchup with 2 tablespoons brown sugar. Spread over top of meatloaf. Broil in oven for 5-7 minutes while you finish the potatoes. 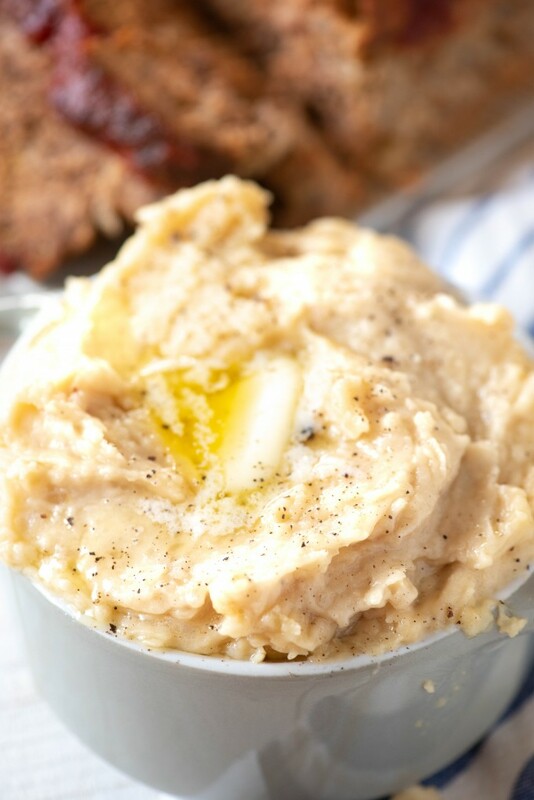 Use a potato masher to mash potatoes and butter together in inner pot. NOTE: I did not have any water left in my pot, if you do, feel free to drain the potatoes and return to the pot. Use a hand mixer to whip potatoes, adding up to 1 cup of cream of milk to achieve your preferred texture. Season to taste with salt and pepper. 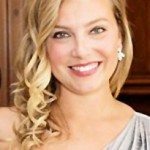 Have not been able to find recipe for Instant Pot Meatloaf and mashed potatoes —–??? Find other recipes though. Would like to have the Meatloaf recipe. I love, love that both dishes are made in the IP. Genius! And such a moist flavorful meatloaf, too!